Deborah Rambo Sinn’s diverse career has taken her around the world. She has given concerts and masterclasses on four continents and has taught students from more than 14 different countries. She lived in Hamburg Germany for five years where she played concerts and musicals and operated two music studios for coaching and private instruction. Her performing career includes giving concerts and masterclasses in four major cities with her piano/cello duo by invitation of the government of Mainland China. In addition to a lifetime of playing classical music, she has played for productions of Little Shop of Horrors, Cats, Phantom of the Opera, Wizard of Oz, Mikado, The Little Mermaid, and 42nd Street. She holds a doctorate from Indiana University, where she studied with Menahem Pressler (Beaux Arts Trio). Before moving to Germany, she served on the music faculty of Angelo State University in Texas and taught one semester at Universität Lüneburg (Germany) as an exchange professor. She served as the 2015 Distinguished Professor for the Humanities at Missouri University for Science and Technology. 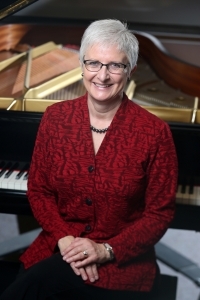 Currently, she teaches piano in her Post Falls, Idaho studio and online, including working with piano teachers from across the country through the Underground Conservatory. This semester, she is teaching at Gonzaga University in Spokane. She is in high demand as a speaker and has presented at MTNA national and at numerous state conferences and at the National Keyboard Pedagogy Conference. Dr. Sinn is the author of Playing Beyond the Notes: A Pianist’s Guide to Musical Interpretation, published by Oxford University Press in 2013 (10th+ printing), widely used in university music programs and independent studios across the US, Canada, and Europe.